Eté Cafe is located in one of the most hidden corner in George Town, where there are also a few hidden gems around the area. It is a simple and cozy cafe owned by a Taiwanese that decided to settle down in Penang with his specialty in French Pastries and Desserts. My last visit was quite some time ago, and I went very early in the morning where they didn't even start their business yet, but thank goodness they are kind enough to let me in first. There weren't much choices for me yet, and I was still full from my brunch and therefore I ordered a cup of espresso to go with their signature macarons. Their coffee is rather aromatic with a hint of bitter fruity flavour. Selling at RM5 per cup. There were many flavours available but I choose green tea, rose and sea salt flavour. All three were rather flavourful and special than just typical sweet macarons. You can really taste the flavours in the fillings of every macaron. The sea salt flavour really did blew me off with the salty taste of macaron. Macarons are selling at RM15 for 3 pieces. Eté Café @ Carnavon Lane. Address: 25, Lorong Carnavon, 10100 George Town, Penang. Free Kochabi Ice Cream with UberIceCream, Uber Penang! Today is the day that Uber is giving out free ice cream to all users in Penang! Nothing quite encapsulates the memories of your childhood than enjoying ice cream with friends – and this Friday, Uber is taking you back to your childhood with ice cream on demand. Scheduled to be run simultaneously in over 250 cities around the world, this will be Uber’s largest event of the year – and Uber Malaysia is excited to be participating for the first time in this event. While global in nature, UberIceCream in Malaysia will have a distinctly local flavour to it – flavours that Malaysians of all ages will recognise and love. This time, Uber Penang is bringing you Kochabi! a maker of traditional ‘ice-cream potong’ to deliver that sense of nostalgia to riders with flavours such as durian, red bean and mango. We will be serving 6 different local flavours in each order at RM25. Uber Penang is partnering with Kochabi, a maker of traditional ‘ice-cream potong’ to deliver that sense of nostalgia to riders with flavours such as durian, red bean and mango. We will be serving you 6 different local flavours in each order at RM25. Users in Penang will be able to get their frozen treats between 11:00am – 5:00pm. No cash is needed. Your order is charged straight to your payment card on your Uber account. Other than that, you may also use my code at #UBERPGJJZAI to claim yourself 2 free rides worth RM30! 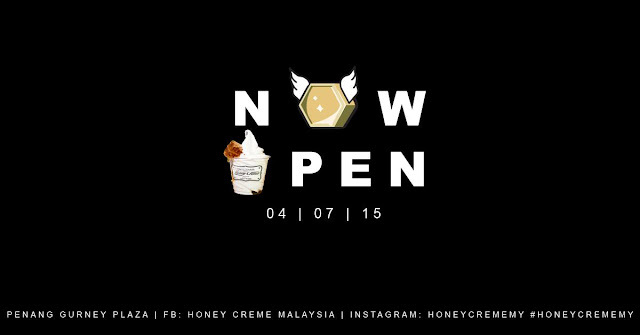 I'm definitely an ice cream lover and thank god I managed to be the first to try this delicious Ice Cream with Honey Comb, selling at RM14.90 each cup. I would say that it is rather expensive for a cup of ice cream, but if you were to think about them using real honey, then it would consider rather reasonable. Well I'm pretty lucky to be there early as they were having 2 days of "Buy One Free One" promotion. So I bought 2 cup of ice cream at only RM14.90. It tasted pretty awesome and I didn't expect that honey could go so well with vanilla ice cream! Definitely a must for sweet tooth like me! Honey Creme is located at the basement floor of Gurney Plaza, it is not difficult to spot on as there are not many stalls around the that floor. It's been awhile since I last went back to Beep Beep Q Restaurant. I've been missing it a lot especially those juicy and tender barbecue meats that make every bite so delicious and satisfying. I have heard many people have been saying that why Beep Beep Q is only opens at night but not during lunch time? Good news is, Beep Beep Q is now available during lunch time as well as a la carte menu is now available in the restaurant as they also came to know that some people have small appetite but they wish to try those delicious barbecue dishes in Beep Beep Q. Other than that, they have also got some new items on the menu that will catch your attention for sure! Beep Beep Q Restaurant could be a great dining place, especially when you are planning for a bbq party and lazy to prepare. Furthermore you don't need to get your hands dirty, everything can be solved at Beep Beep Q Restaurant. Little W of Beep Beep Q do change style from time to time. I've seen Imin decorated it as Rudolph during Christmas too!